A few boats have figured into my hobbies over the years. 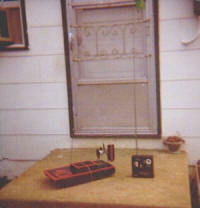 In fact, the first radio controlled model I ever operated was the makeshift airboat shown to the right. The RC airboat used my newly-acquired, second-hand, OS Digital 3-channel radio and Cox Baby Bee .049 engine with a pusher prop. The hull and radio compartment were made out of laminated 1/2" thick Styrofoam insulation that was cut and sanded to shape, and then covered in Solarfilm (that was a low temperature Monokote-like iron-on covering). The good thing about the Styrofoam construction is the craft was unsinkable. The bad part was the Cox .049 Baby Bee that powered it was unreliable, so I could not take it any farther into Bear Creek (in Mayo, Maryland) than I cared to wade or sometimes swim to retrieve it when the engine quit. It was lot of fun, and I was mesmerized by the fact that I was at long last actually remotely controlling something - anything! I supposed you'd have to be as smitten as I was with modeling to understand. Maybe you do. 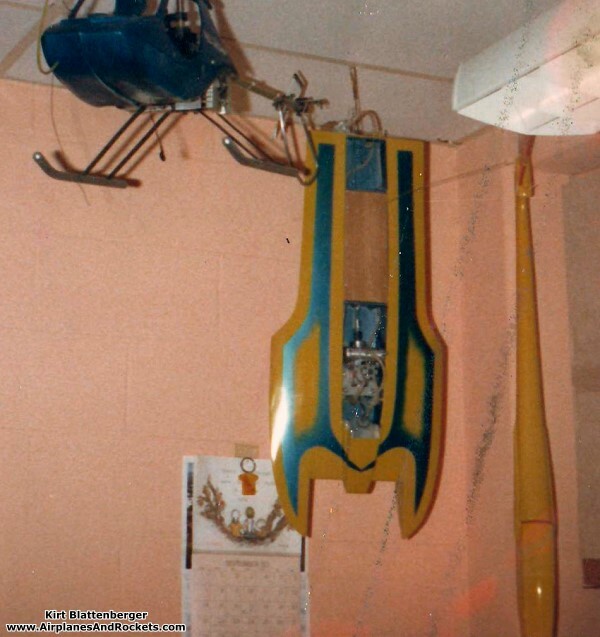 Around 1978, before entering the U.S. Air Force, I built a Dumas Pay N Pak unlimited hydroplane model. 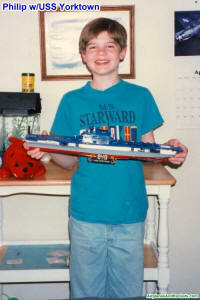 I cannot recall which engine I used, but it was a marine type with the water-cooled head. To start the beast, I used a piece of string about 1/8" in diameter, threaded it under the grooved flywheel, and gave it a tug. Once the engine was broken in, starting was not so bad. I built it shortly before going into the USAF, and then on a trip home, brought it back with me to the barracks. The photo to the left shows it hanging without the cowling in my barracks room at Robins AFB, GA (c.1980). The Pay N Pak ran a few times in a lake somewhere around Macon, Georgia. 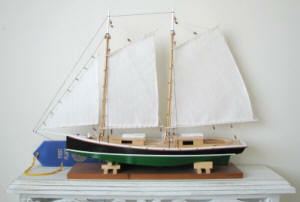 After the war (that's a joke), it ran a few times in the Severn River in Annapolis, Maryland. Sometime before packing up to move to Vermont, I sold my Pay N Pak to a local guy who answered an ad I placed in the newspaper. Also shown are my DuBro Tri-Star helicopter and an Airtronics Aquila RC glider with ABS plastic fuselage. 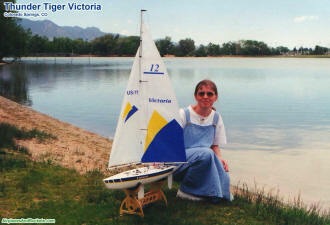 Melanie with her Thunder Tiger Victoria R/C sailboat at Prospect Lake in Colorado Springs, Colorado. 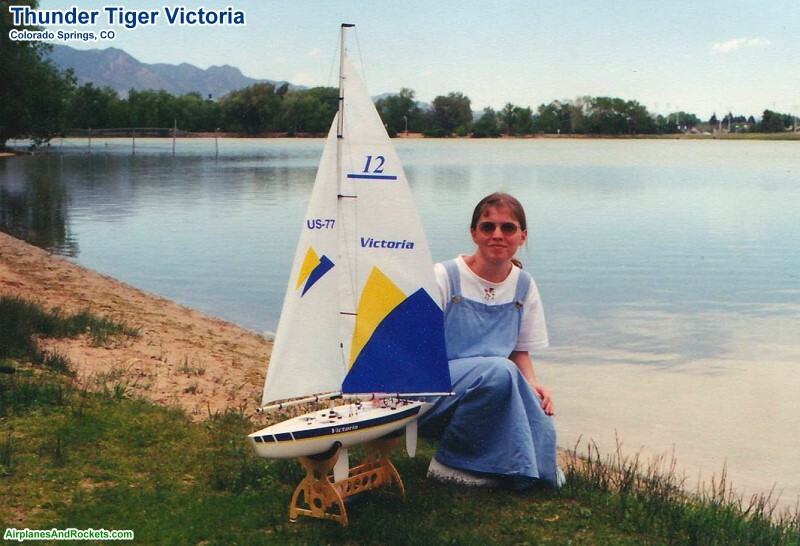 Melanie Blattenberger with her Thunder Tiger Victoria RC sailboat at the small lake behind the Hewlett Packard building in Loveland, Colorado (I worked for Agilent, formerly HP, at the time). Many moons later, Melanie, my wife, developed an interest in RC sailboats, so we bought a Thunder Tiger Victoria. It was apparent while assembling the model that there were some deficiencies in the design as far as durability was concerned. We went ahead and assembled everything per instructions and set is on its maiden voyage on Prospect Lake in Colorado Springs, Colorado. After only about two voyages, our suspicions were borne out. The design engineering cap camp out, and I set forth to right all the shortcomings. 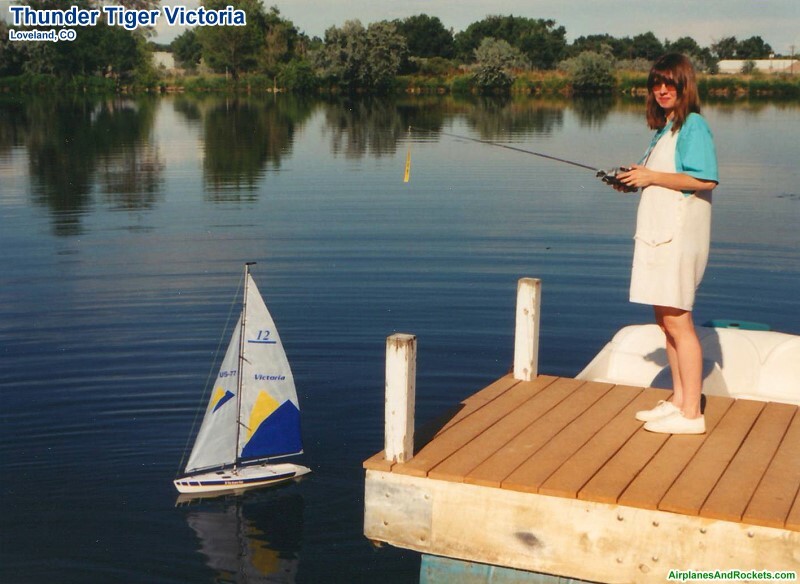 All of the modifications to the Thunder Tiger Victoria RC sailboat made are documented in detail beginning on the following page. 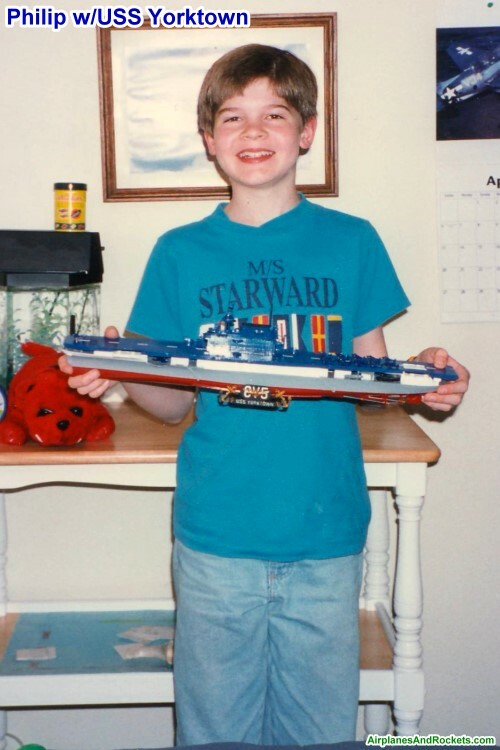 Above is my son, Philip, holding his plastic model of the USS Yorktown. You can see his award-winning U.S.S. Arizona model here. 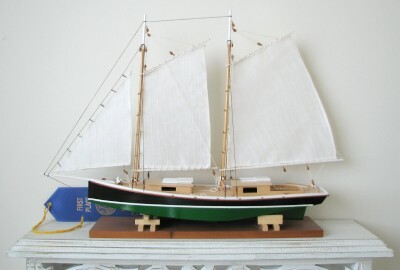 Sometime around 2004, Melanie decided she wanted to try her hand at building a model boat, so we bought a Midwest Products Muscongus Bay Lobster Smack (left) and a Sharpie Schooner (right). She graciously offered to let me build them for her after surveying the immensity of the task. 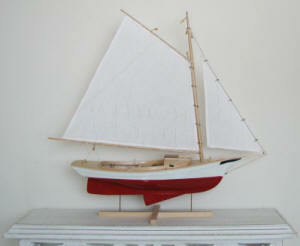 The Sharpie Schooner actually won a 1st Place ribbon at the 2004 Dixie Classic Fair, in Winston-Salem, North Carolina.